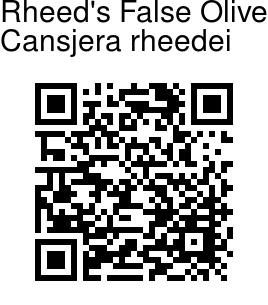 Rheed's False Olive is a large evergreen climbing shrub, armed with scattered stout spines, with a cream-coloured somewhat corky bark. Branchlets, leaf-stalks and inflorescence are velvety. Leaves are ovate- lanceshaped, hairless and slightly velvety 3.5-10 cm long. 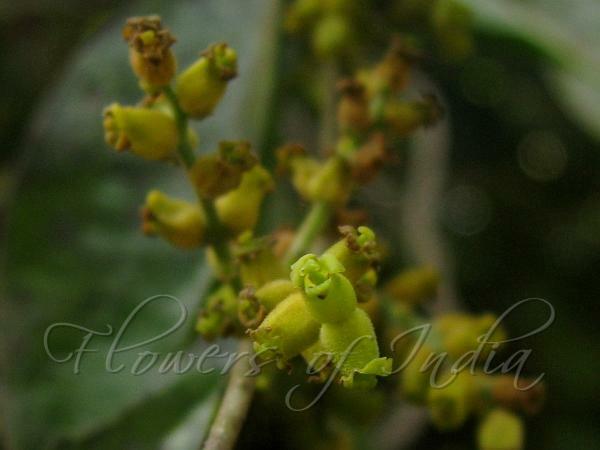 Flowers are small, yellow or yellow-green, urn-shaped, 4-lobed, hairy outside. Fertile stamens are 4, opposite the petals. Staminodes are 4-5, alternate with the stamens. Fruit is orange-red when ripe, 1.2 cm long. Photographed at Karikale, North Karnataka & Nagla Bundar, Maharashtra.